Before planning our trip to Antarctica, I don’t think I’d heard of South Georgia. It comes up often in stories of Shackleton, the Antarctic explorer, but if I learned about him in school, it was long forgotten. Now that I’ve been there, I can say that it was worth the trip. And it was quite a trip: from the tip of South America, it took a day to sail to the Falkland Islands. From there, it took two days to sail to South Georgia. We were out there. 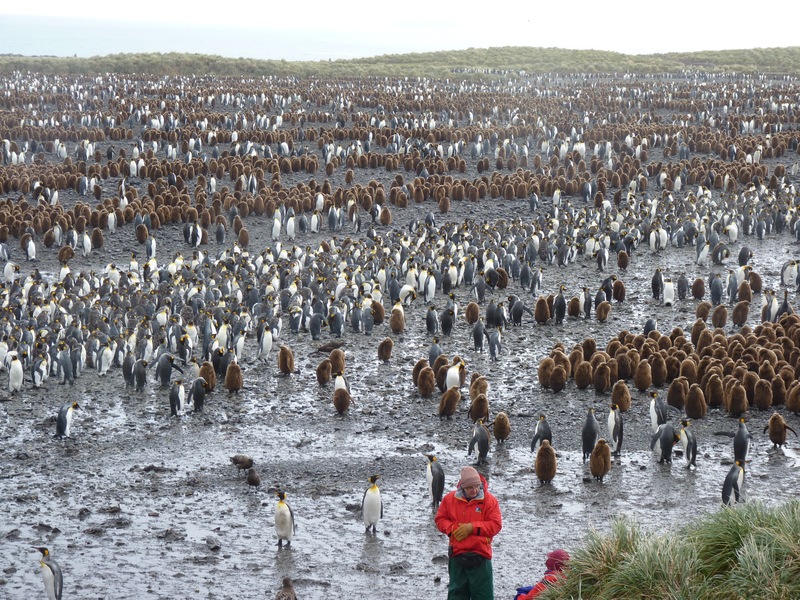 Lots and lots of King penguins. This photo is from Salisbury Plain, which was our first stop in South Georgia. I came to see penguins, and I was not disappointed! The brown fuzzy ones are called Oakum Boys, but I call them the teenagers. They’re pretty big but not yet full-grown and don’t have their adult feathers yet. 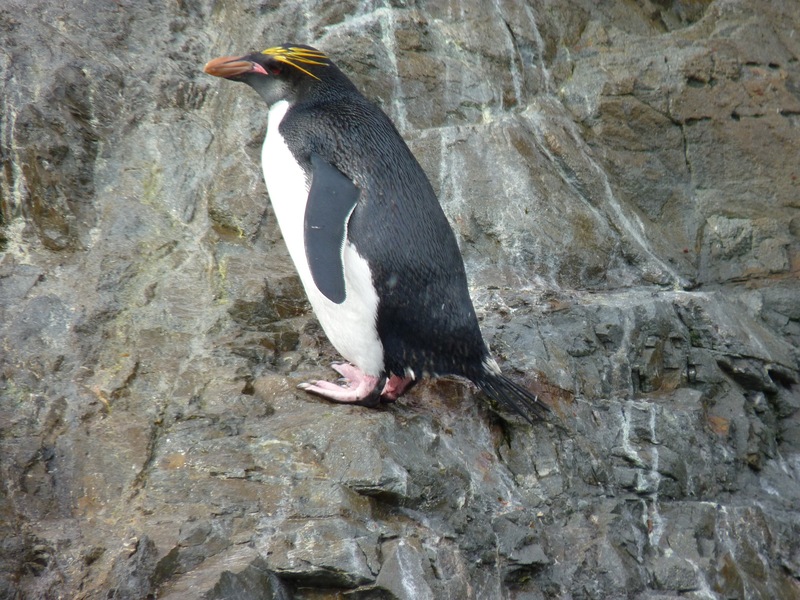 We also saw Macaroni penguins in Hercules Bay. I’m not a birdwatcher, but it’s always interesting to see different types of birds in other parts of the world. 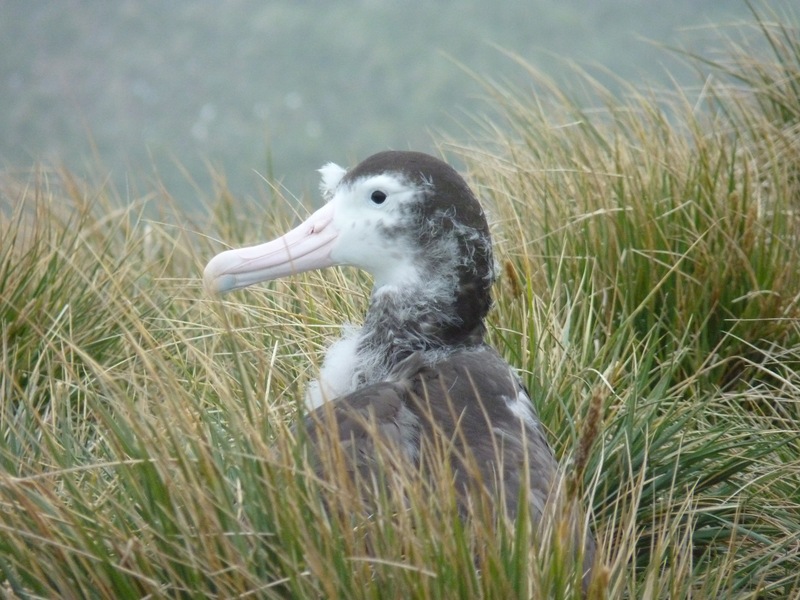 Here’s a baby Albatross sitting in a nest on Prion Island. Albatrosses are huge, so even the baby is pretty big. We also saw the elusive South Georgia Pipit. I don’t have a photo of it, but the bird expert on our ship was really excited about this bird. It’s South Georgia’s only songbird and is threatened by rats. Rats were introduced to South Georgia by ships, and now there are measures to prevent further infestation (which is great, because I hope there were no rats on our ship!). We didn’t see any rats in South Georgia, but we did see some Reindeer. Reindeer were introduced by humans and are not native to South Georgia. They also don’t quite look like Santa’s Reindeer. 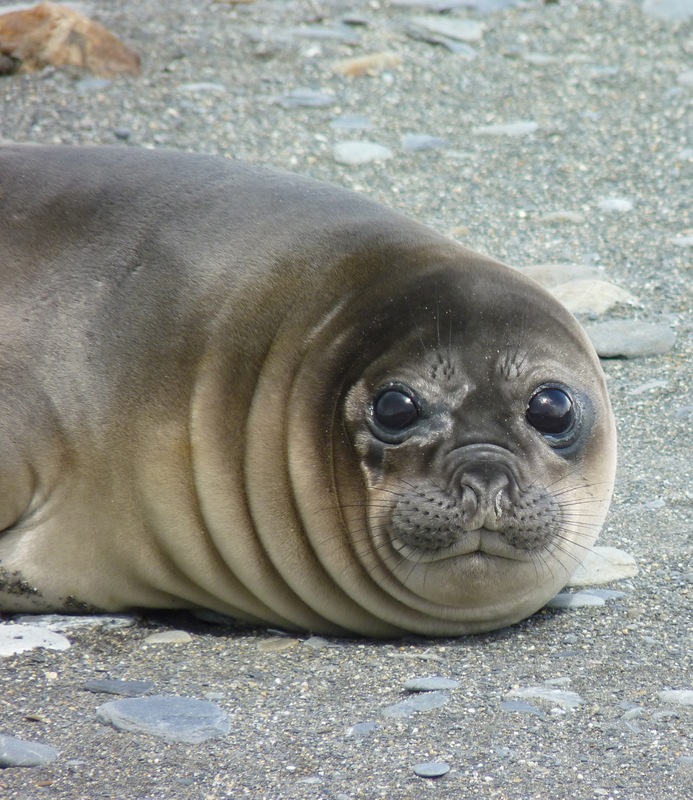 We also saw lots of super-cute baby Elephant seals (note that the babies were about 400 pounds). 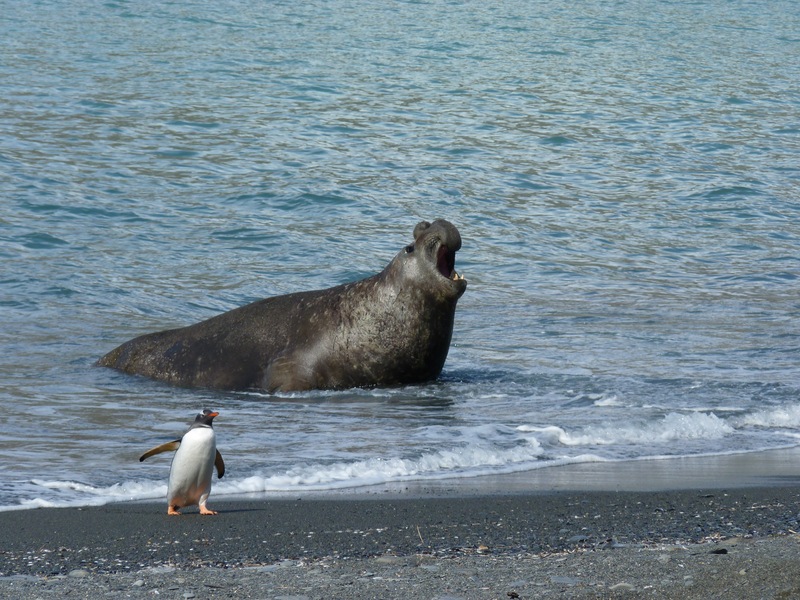 And full-grown Elephant seals. They were fine as long as you stayed out of their way. 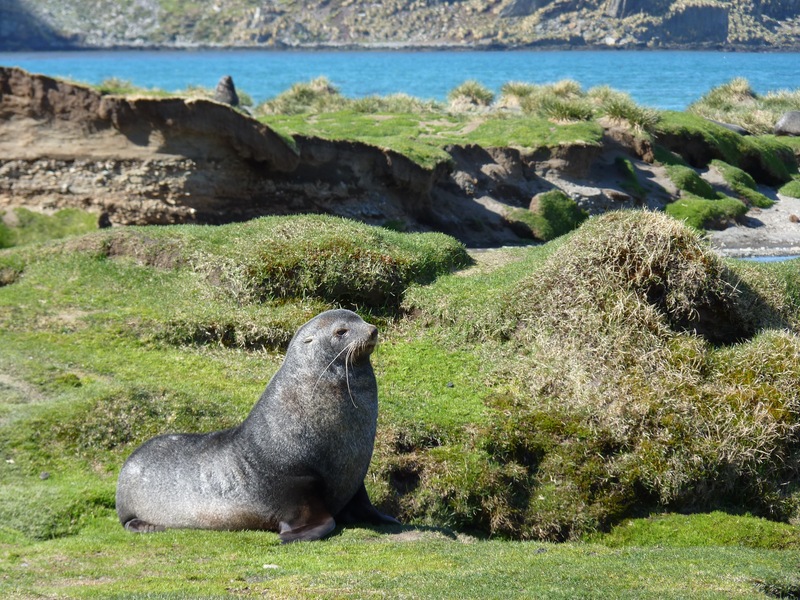 Plus a lot of Fur seals, which look regal, but stay out of their way or they will come after you! There weren’t any injuries in our group, but they showed us photos of a mangled hand as a warning not to get too close to the Fur seals. We also visited Stromness and Grytviken, both of which are former whaling stations. In Grytviken, we visited Shackleton’s grave and toasted him with whiskey. At least I’m pretty sure it was whiskey…it was cold, windy, and rainy, and I appreciated the burst of warmth from the alcohol. But nice weather wasn’t one of the selling points of this trip. 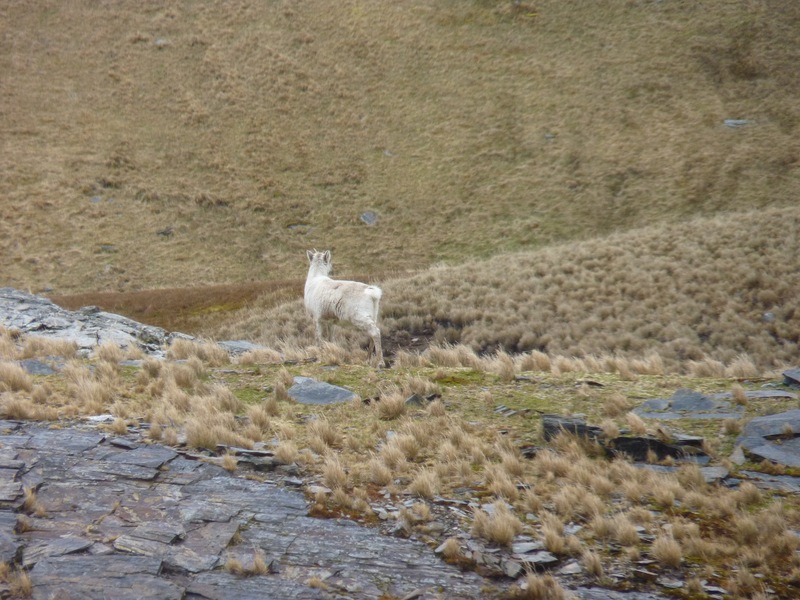 The scenery and the wildlife more than made up for the weather. 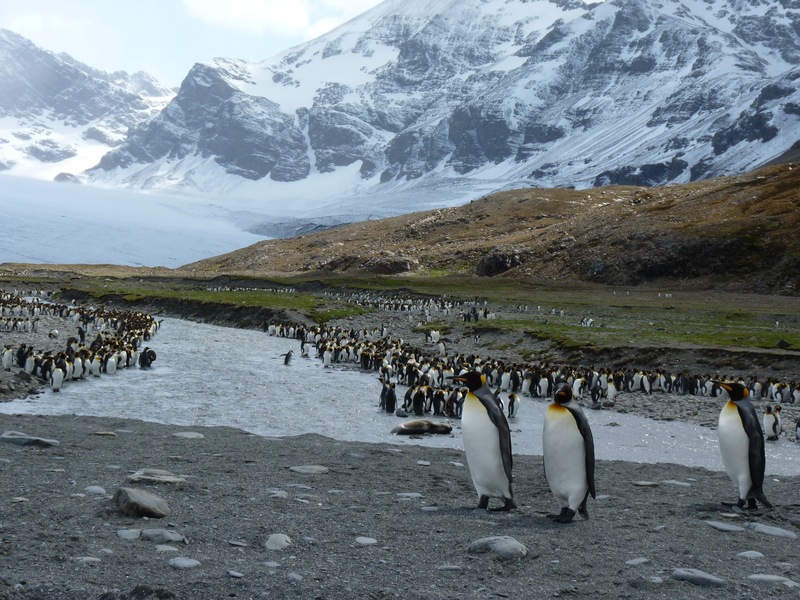 Still to come…the Falkland Islands, featuring two more kinds of penguins. 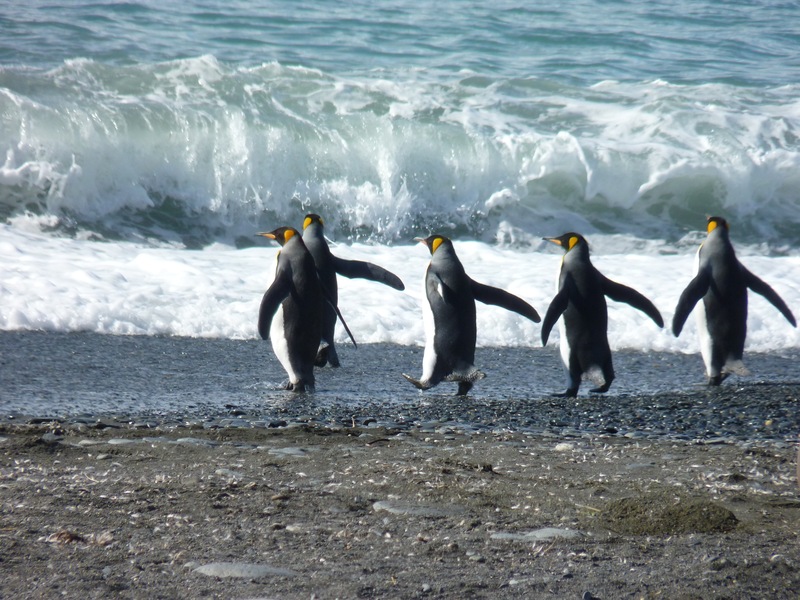 Absolutely awesome experience – I really love penguins, I went to see the little penguin come ashore on Philip Island in Australia, but it was nothing compared to this – looking forward to the next bits. Penquins! What an awesome trip. 🙂 Great pictures. I love all the photos, but the last two are really special. 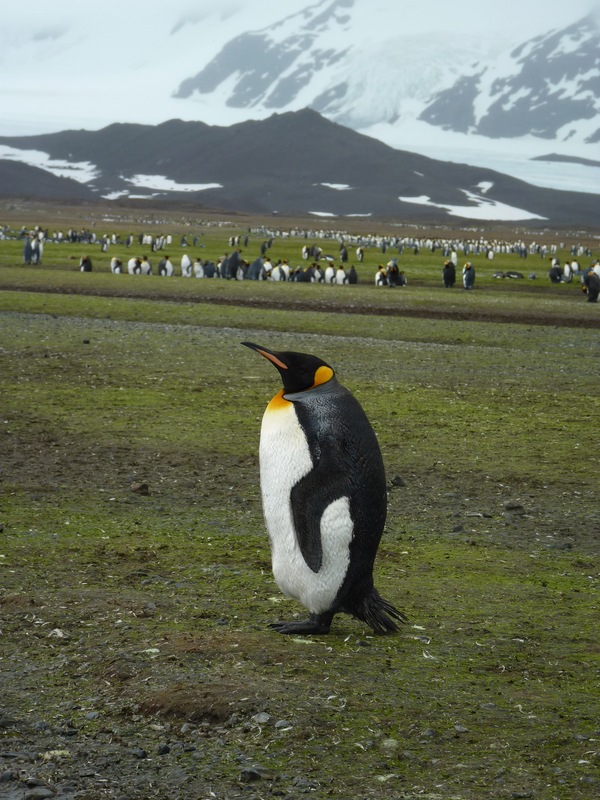 I can’t believe all the penguins you saw, let alone the other fantastic animals. I am so in awe of this trip; cross my fingers that I’ll get there someday! Oh my word, Jill, I lost count of how many times I said “awww” as I read this post. Gorgeous animals and great photos. I hope I can take such an amazing trip one day! What a fun post to read…loved it, thanks for sharing it all with me. Your photos are beautiful…I’m in love with that wonderful seal with the cute face! I love your photos! What an amazing trip you had! Love the penguins – and the babay albatross – and the seals. Delightful! I am living vicariously through your stories and photos from your trip. I would LOVE to do this one day! !